This was an impressive show for a couple of key reasons. Firstly, the textile artworks of Tamara Marwood stand on their own as art, regardless of their material, process and use. Secondly, for a venue to support a collaborative exhibition exploring product design, manufacturing and art is a bold and welcome move. Sure, Bendigo seems keen to ride its newly nichefied territory of clothing and clothed celebrity, but this show looks more intently into the very fabric of the adornments we cloak ourselves with and the manner in which we do or do not produce and recycle these. 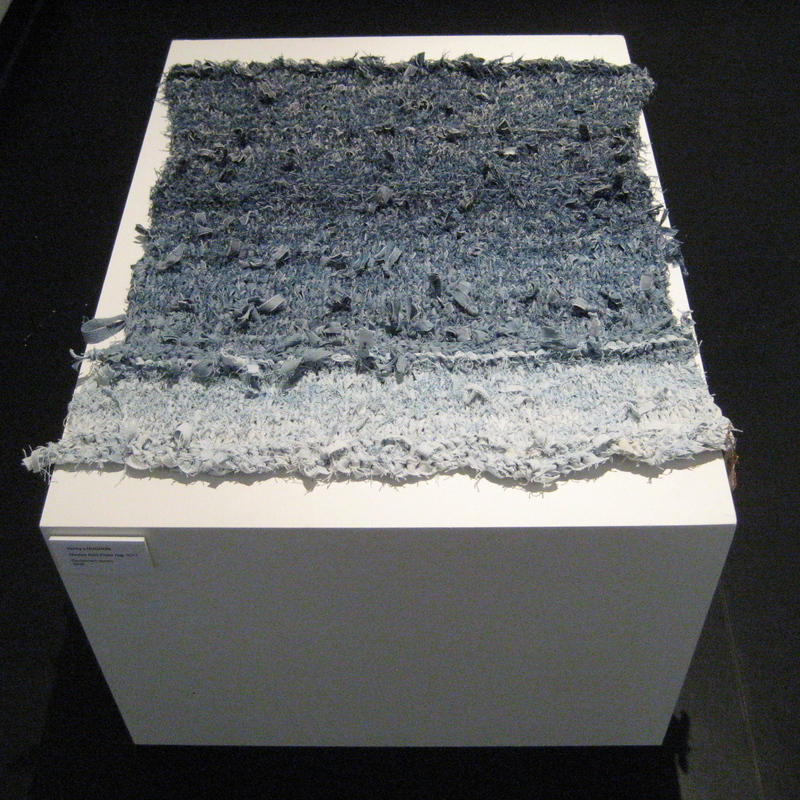 ‘Dirty Denim’ is a collection of works from Tamara Marwood, together with Verity Lougoon, using recycled denim as the primary material. The high quality of all of the pieces in the show immediately turn to the very notion of recycling, the way in which we can re-utilise materials for beneficial outcomes. Where denim stands as the focal point in the show, the message clearly extends to all materials and our growing concern over the production and distribution of our consumer items. The idea that recycling could be reworked into upcycling is also a key concern of the show. This is where used products are reworked into uses of a higher quality or purpose than their original use. And so, from cheap, mass-produced clothing that served its use for about a year, to a highly crafted, well considered product capable of lasting much longer and serving a wider benefit. The way in which the exhibition was curated was also very well considered. Mannequins bearing denim clothing, more recognisable as shop fittings in a fashion boutique, sat comfortably with denim hung as canvas on the wall and a plinth bearing an exotic looking rug. Branches attached to the wall, upon which were hung works by Verity Lougoon, echo the underlying organic influences at play, while hinting back to visual merchandising. This cross-pollination of commercial design with traditional fine art helps break the barriers between disciplines and enables a non-heirarchical conversation about shared concerns. The abstract wall works by Tamara Marwood were especially engaging. Reading foremost as abstract imagery (in the line of say, Sean Scully), the subtle hint of landscape is ever present. When combined with thoughts about the material, its origin in cotton fields and agricultural production, this amplifies the relationship between fashion, farming and landfill. And this two-pronged evocation reinforces the strength of these pieces. Standing in the space, surrounded by thoughts of recycling, abstract pattern making, the pixellated nature of combining unitary sections, the relationship between art and commerce, I was also taken by the nature of the dyes used in denim. The gradient of indigos in the space saturated the fabrics to varying degrees, speaking of faded sun exposures and the rich colouration of newly manufactured goods. There’s a lot to like about a show like this and it’s well worth a trip to the La Trobe VAC to check it out. Tags: La Trobe VAC, review, Tamara Marwood, Verity Lougoon. Bookmark the permalink.